Thank you so much! Our family loved staying here! All of our kids said this was the BEST VACATION EVER!!! We'll definitely be back! Just wanted to let you know that we had a wonderful time at your cabin. It was a perfect “decompress” place. We really enjoyed the quality of the cabin, the details you have not overlooked to guide guests, and the quaint ponds and streams around the development. We are already talking about when we could go back. This cabin is very clean and provided all the amenities you need for a great weekend getaway. The owners rental process is the best! I highly recommend staying at this cabin. We enjoyed our stay. You have a very nice, clean and organized cabin. We do rent quite a bit and this was the cleanest cabin we've ever stayed at. Awesome property. Great locations. Quiet neighborhood. Will definitely come back in the winter season. We had a very good time. The cabin is beautiful. Everything was in perfect condition. We really enjoyed our stay. We totally recommend it to everyone! The master bedroom mattress was very comfortable. We are currently trying to find the same one for our bedroom. The neighborhood was very quiet which was a big plus. I'd like to go back during the winter and check out the ski resort. 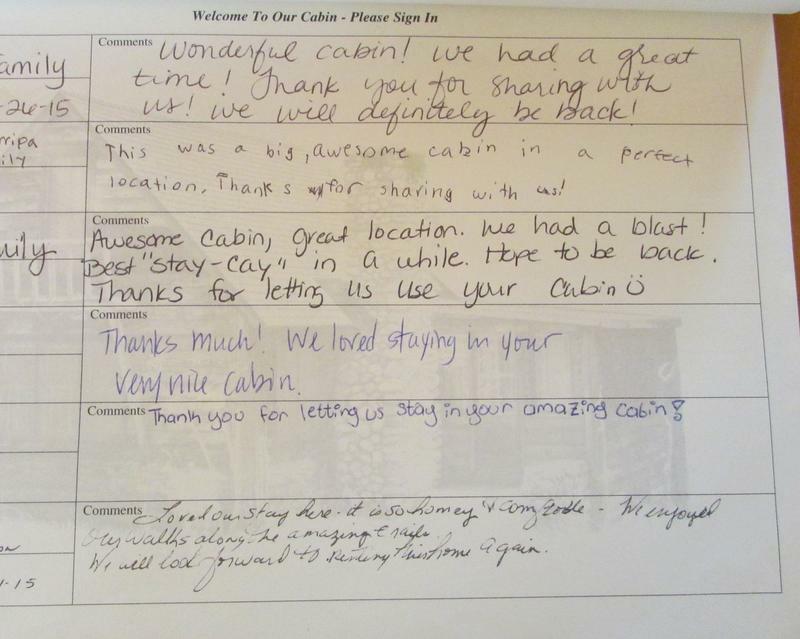 We definitely enjoyed our stay in your cabin. It provided us a very comfortable place to chill and relax after spending time outdoors in the beautiful weather. Also appreciate the fact that the kitchen was stocked with anything you could possibly need. We hope to stay longer next time. Thank you very much. I just wanted to let you know that we really enjoyed our weekend stay at your cabin. The facilities and area were beautiful, and everyone in our party had a great time. We would certainly like to visit again in the future. Thank you again for providing a wonderful getaway. From the cabin to the town everybody and everything was so welcoming and FUN!!! Thank you so much for allowing me to show my family a beautiful place. We are all Mesa born and raised and never been to a more welcoming city before. From the cabin to the town everybody and everything was so welcoming and FUN!!! Thank you from the bottom of my heart. The binder was so helpful in allowing us to find good places to go fishing and hiking. I will recommend this cabin to everybody and anybody that wants to have a great memory. Thank you Craig and Cindy for letting us share your home. We enjoyed staying at your cabin very much. It was very clean, well stocked and had everything we needed during our stay. Location was also good, close to shopping, restaurants and not too far from Sunrise Ski Resort either. We will for sure be back again and we will recommend your cabin to all of our friends. Very nice cabin! Owners were very helpful and worked with us on short notice. We would recommend this cabin to our friends and family!